Long time ago, more or less at the beginning of this blog, I had told you about this bakery with the strange name, and I had talked about its scones, its buttermilk brioches, and maybe even about its special cooperative management structure, a unique experiment in the local scene, where each employee becomes an equal partner, and enjoys the same pay as any other. Well. Now I can imagine that the news I'm about to give will not make you scream of joy, but it's with great pleasure - mine and of everyone living in the southern neighborhoods - that I can finally announce the opening of the second Arizmendi in SF, tucked between a wine bar and a yoga studio on Valencia Street, envied by all the Pupuserias and Panaderías of the Mission district. And if that still doesn't mean anything, just think that from now on I can literally walk there. Because Arizmendi and I are now neighbors! To celebrate this joyous event, I went and grabbed from the shelves an old acquaintance of mine, masterfully escaped from the massacre of few months ago. If I remember correctly, at the time of the first Arizmendi post, I had also promised to try all the scones in the book, one by one (and very wisely, I had also avoided giving myself a deadline for the project). 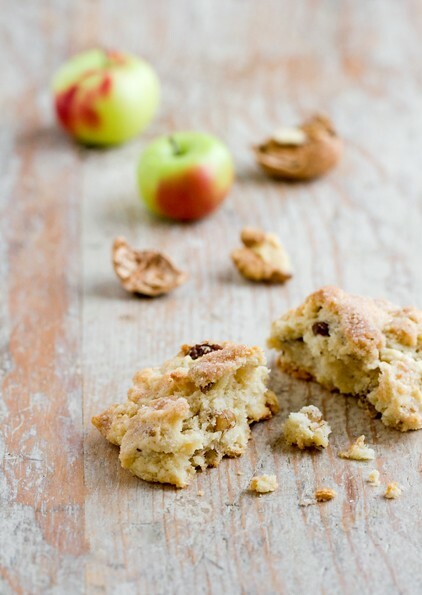 Hence, after 15 months, 10 days and 9 hours, here they are, Walnut, Apple and Raisin Scones, aka Arizmendi No.2. Sift the flour and mix it with sugar, salt, baking soda and baking powder. Add the cold butter, cut into small pieces, and mix quickly until the butter is fully covered with flour and it's broken into small bits. Add raisins, apples and coarsely chopped walnuts, and mix. Make a well in the middle of this mixture and pour in the cream and buttermilk. Mix quickly, just until the ingredients are sufficiently blended together. Shape the dough in small rounds of about 2 inches diameter for smaller scones, or about 3 inches diameter for six larger scones. Place the scones on a baking sheet covered with parchment paper, leaving them quite apart from each other, because they widen and flatten out during baking. Sprinkle the surface with 3 tablespoons of sugar mixed with some cinnamon and bake them at 375 for 20 or 30 minutes, until golden brown. Transfer them on a rack and let cool off. Right out of the oven, scones are very soft, and they will get firmer after cooling down. But they will still be very soft inside, thanks to the buttermilk. You can make them in a second, and if you mix the dry ingredients the night before, you'll have them ready for breakfast in just about the time you can say Coffee! However, they should be consumed the same day.